Performers: Luna Morgana, Naomi Gilby, Natasha Glew and Adam Ekin. 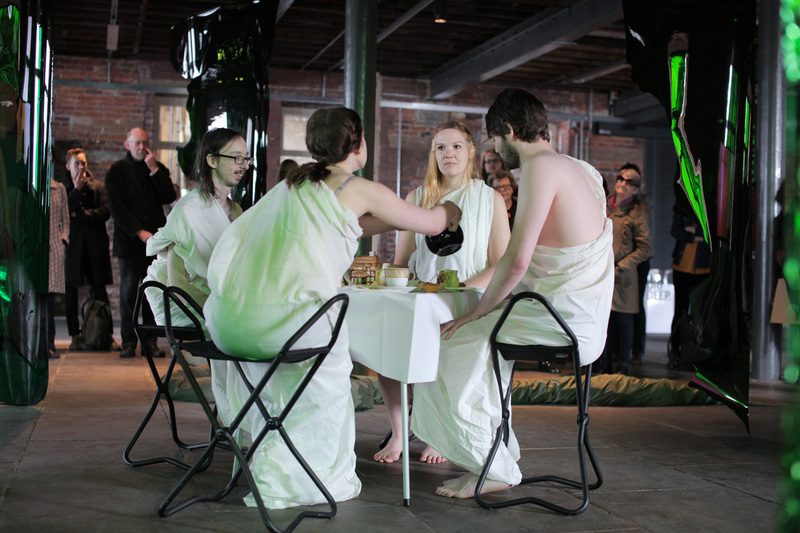 Serve for the Gods was produced for an artist residency as part of Pavilion's Follies of Youth programme. Artists, writers and producers involved in the project were invited to be in residence during the Follies of Youth exhibition at the Hepworth and produce work as part of a finnisage to the exhibition. This performance is based around the Greco-Roman mythologies that underlie the landscaped gardens produced by Lancelot 'Capability' Brown, where these gardens often had a temple to Venus or Apollo or to some god to be used as a status symbol and not to be worshiped as they would have been in eras gone by. Serve for the Gods speculates on reasons for the disappearance of the three halls of Byram, Stapleton and Whitley Beaumont. Ancient gods are notoriously fickle and would have taken the temple follies as a slight. As this could be seen as mocking the gods and their temples, the gods have returned the slap by mocking quintessential Britishness and destroying these great halls.